Tidies and performs preliminary analysis of 'Coursera' research export data. These export data can be downloaded by anyone who has classes on Coursera and wants to analyze the data. Coursera is one of the leading providers of MOOCs and was launched in January 2012. With over 25 million learners, Coursera is the most popular provider in the world being followed by EdX, the MOOC provider that was a result of a collaboration between Harvard University and MIT, with over 10 million users. Coursera has over 150 university partners from 29 countries and offers a total of 2000+ courses from computer science to philosophy. Besides, Coursera offers 180+ specialization, Coursera's credential system, and four fully online Masters degrees. For more information about Coursera check Coursera's About page on < https://blog.coursera.org/about/>. This in an R package for cleaning and some preliminary analysis of Coursera research data exports. The package helps import and organize all the tables in R. It also run some preliminary analysis on the data. Note that this package is still under development and the auther appreciates feedback and suggestions. to install this package, you will need to install devtools. Install the devtools package, available from CRAN. Research on Massive Open Online Courses (MOOCs) is young. studied literature published on MOOCs through 2015 and found that the number of articles published on the subject increased from 1 in 2008 to 170 in 2015. More research is needed to fully understand the effectiveness, reach, limits, and the potential of MOOCs. However, the main challenges in studying MOOCs remains to be data. Data on MOOCs are not usually publicly available since it is owned by private providers and there are concerns about the privacy of students. More importantly, as Lopez et. al point out, the size and complexity of MOOC data is an overwhelming challenge to many researchers. Therefore, it is imperative to provide tools that pave the way for more research on the new subject of MOOCs. This paper introduces a package called crsra based on the statistical software R to help clean and analyze massive loads of data from the Coursera MOOCs. Coursera is one of the leading providers of MOOCs and was launched in January 2012. With over 25 million learners, Coursera is the most popular provider in the world being followed by EdX, the MOOC provider that was a result of a collaboration between Harvard University and MIT, with over 10 million users. Coursera has over 150 university partners from 29 countries and offers a total of 2000+ courses from computer science to philosophy. Besides, Coursera offers 180+ specialization, Coursera’s credential system, and four fully online Masters degrees. A typical course on Coursera includes recorded video lectures, graded assignment, quizzes, and discussion forums. Since the early years of the company, Coursera has encouraged researchers to analyze students’ data and has facilitated the use of the data and the platform for A/B testing. Starting November 2015 Coursera introduced a dashboard for self-service data exports. Through this tool, partner institutions and instructors could download data for a single course or all courses associated with the institution. Research data exports are sets of CSV files and are designed for use in relational database systems. One of the advantages of the data is the existence of a single hashed user ID for each student. This user ID is consistent for learners across all courses offered by an individual institution and allows for connecting learner grades and progress across courses. efficient method for combining data from multiple courses and even across institutions. This is important since although MOOC researchers have access to thousands of students in their sample, few studies benefit from data across multiple courses and institutions. Such analysis helps draw more robust conclusions about student behaviors. provision of a set of functions for analyzing student behaviors. There are five types of research data export for each course. Table below summarizes these five types. The data are written in roughly 100 tables containing information such as course content, students’ demographic data, progress, and outcomes, and forum data. Assessment submission data Assessment submissions of quizzes, peer review, and programming assignments by learners. Course grade data Contains the highest grade achieved by each learner on each required assessment as well as the time stamp of the learner’s highest-scoring submission. This table also includes each learner’s overall grade in the course. Course progress data Contains data documenting the time stamp for when the learner interacted with each piece of course content and the time stamps for when items were opened, completed, reopened, reattempted, etc. Demographic data Contains the following information for all enrolled learners: general geographical data (based on IP address), browser language preference, and information for learners who completed their learner profile responses or participated in Coursera’s platform-wide demographic survey (including age, gender, education level, and employment status). Discussion data Contains forum activity data such as posts, responses, upvotes/downvotes, flags, and questions and answers associated with course content items. Figure below shows different types of research data exports provided by Coursera. While Coursera provides tools for creating PostgreSQL databases in a docker container, as we mentioned earlier, importing data for analysis remains to be a challenge for researchers with limited experience with relational databases. Moreover, such tools are usually not platform independent. To import your data dump into R, you will first need to unzip your data exports into one folder. There are two ways to import the data. You can import all your courses at once by poining your working directoty to the folder that contains all the unzipped folders as following. Then execute the command crsra_import. Setting the check_problems attribute to FALSE will turn off warnings when importing the csv files. A second method is to import an individual course. For this type of import unzip the data export for the course and set your working directly to the folder that contains all the csv tables. You can also dowanload the dummy data included in the inst/extdata folder in the package source codes. If you are not pointing to the correct directory, you will receive a warning, and the execution will be halted. Note that the data import may take some time if the course data is large and there are several courses in your working directory. The package also includes a few other functions in addition to the main crsra_import() function. A list of functions and their descriptions is provided in the table below. crsra_membershares Returns a summary of the total number and the shares of users in each course broken down by factors such as roles, country, language, gender, employment status, education level, and student status. crsra_gradesummary Returns total grade summary broken down by the factors mentioned above. crsra_progress Summarizes, for each course item, the total number and the share of users who ceased activity at that specific course item. The function ranks course items by their attrition. crsra_assessmentskips Users may “skip” reviewing a peer-assessed submission if there is a problem with it. This function categorizes skips by their type such as “inappropriate content”, “plagiarism”, etc. The function also returns a word cloud appeared in peer comments as to why they skipped the submission. crsra_deleter_user Deletes a specific user from all the tables. Similar to the example above, we can use the function crsra_gradesummary() to calculate the average student grade for the courses in the data import. By using the argument groupby we can calculate average grades for different learner subgroups based on gender, education, student status, employment status, and country. For instance, the following analysis returns the average overall course grade for male and female learners in the course The Data Scientist’s Toolbox. The results show that female learners’ grades are on average 6 points lower on a 100 scale than male learners’ grades. #Note that maximum grade possible is 1. The existence of fundamental differences between traditional education and MOOCs has attracted a new wave of studies on students’ behavior and outcomes in the online world. These differences are best reflected in the definition of MOOCs by McAuley et al. that “[a]n online course with the option of free and open registration, a publicly shared curriculum, and open-ended outcomes which integrates social networking, accessible online resources … and most significantly builds on the engagement of learners who self-organize their participation according to learning goals, prior knowledge and skills, and common interests.” Such differences require further research on MOOCs. Understanding how students progress through an education program is critical for any educational planning and decision making. Models of student progress are needed to estimate the probability of a student completing a particular item in a course and predict the time required to finish a course. Furthermore, conventional measures of academic success and progress cannot be defined in the same way for MOOCs. For instance, as Perna et al. state, we have limited knowledge on whether learners’ progress through a MOOC should be measured in a sequential fashion or in a way that captures the flexibility and freedom in learning behavior that is unique to MOOCs. There are only a handful of studies on students’ progress and outcomes in MOOCs. Perna et al. perform a descriptive analysis of student progress through a set of 16 courses on Coursera. They found that most users accessed course content in the sequential order defined by the instructor of the course. Ho et al. study 17 courses taught on EdX and found that most of the attrition in online courses happen in the first week of course activity (about 50 percent attrition) and that the average percentage of learners who cease activity in the second week declines sharply to 16 percent. Most of these studies are specific to a set of courses or platforms. Due to the many differences in the characteristics of MOOCs, any extrapolation of the results to MOOCs in general has to be done with caution. In the following section, we will investigate students’ progress through the ten Data Science Specialization courses on Coursera provided by JHU. Using the crsra_timetofinish function in the crsra package, we can first investigate the time difference between the first and last activities in a course for each student. Time to finish is only calculated for those who completed the course. Figure below depicts the density plot for time to complete for three of the courses in the specialization. Note that the density plot varies across courses. 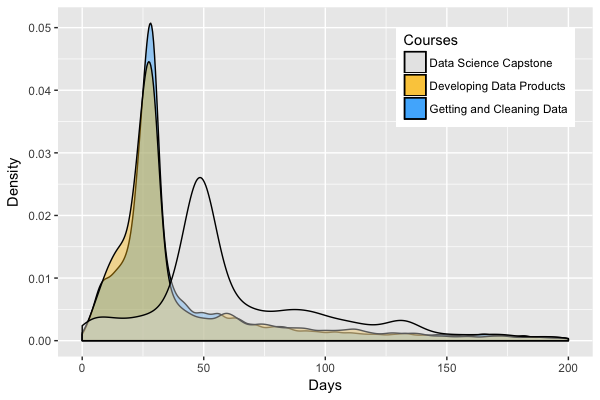 While for Developing Data Products and Getting and Cleaning Data a majority of students finish the courses in around 30 days, for Data Science Capstone a majority of students finish the course in 50 days. If you have any questions or feedback, please report any issues or bugs. Bozkurt, Aras, Ela Akgün-Özbek, and Olaf Zawacki-Richter. “Trends and patterns in massive open online courses: Review and content analysis of research on MOOCs (2008-2015).” The International Review of Research in Open and Distributed Learning 18.5 (2017). Lopez, Glenn, et al. “Google BigQuery for Education: Framework for Parsing and Analyzing edX MOOC Data.” Proceedings of the Fourth (2017) ACM Conference on [email protected] Scale. ACM, 2017. Reich, Justin. “Rebooting MOOC research.” Science 347.6217 (2015): 34-35. In an initial version of crsra based on PostgreSQL, we had the problem of some team members not being able to set up the database correctly on their PCs. McAuley, Alexander, et al. “The MOOC model for digital practice.” (2010). King, Mervyn A. Primary and secondary indicators of education. Department of Applied Economics, University of Cambridge, 1972. Perna, Laura W., et al. “Moving through MOOCs: Understanding the progression of users in massive open online courses.” Educational Researcher 43.9 (2014): 421-432. Ho, Andrew Dean, et al. “HarvardX and MITx: The first year of open online courses, fall 2012-summer 2013.” (2014). Corrected the link in the DESCRIPTION file.